Help heart transplant patients and their families who need support. Any amount helps and the Hope For Hearts Foundation is a 501(c)3 non-profit organization. NEW YORK, NY – OCTOBER 22, 2012 – The 1st Annual Hope for Hearts Foundation Autumn Gala will be held on Friday, November 9, at Porsche Design in SoHo. A roster of guests from the celebrity, music and media worlds are expected to support the Eric De La Cruz Hope for Hearts Foundation, established by TV journalist and news anchor, Veronica De La Cruz., in honor of her brother Eric. De La Cruz founded the organization in 2010 after Eric died while awaiting a heart transplant the prior year. Hope for Hearts’ mission is to provide financial assistance, educational resources and advocacy for heart transplant patients and their families. The flagship Porsche Design store at 465 West Broadway will be transformed for the gala into an elegant salon with a Spanish theme. Co‐hosted by Veronica De La Cruz and Comedy Central’s “Axis of Evil” co‐star, Dean Obeidallah, the event will also include guest speakers including recent heart transplant recipient Colby Salerno, whom the Foundation has supported. Noted health care advocate and former insurance industry executive, Wendell Potter, will keynote the event. The festivities begin at 7 p.m. with a cocktail hour, followed by a buffet dinner featuring dishes from celebrity chefs, and concluding with live entertainment and a silent auction. Items scheduled to be auctioned off at the event range from a one‐week stay at a Thailand resort to anchor‐led tours of NBC studios. 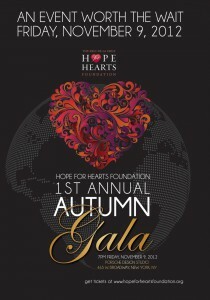 Tickets for the Eric De La Cruz Hope for Hearts Foundation Autumn Gala are now available from $175‐$250, and sponsorship opportunities starting with Patrons of Hope at $2,000 and Angel Sponsors for $5,000 are listed on the official event webpage at http://www.hopeforeatsfoundation.org/wordpress1/gala. The Eric De La Cruz Hope for Hearts Foundation is a 501 (c)(3) non‐profit organization that provides financial assistance, educational resources and advocacy for heart transplant patients, Founded by TV journalist Veronica De La Cruz in honor of her brother Eric, the Foundation exists to fulfill his wish that no heart transplant patient would ever again have suffer because of a lack of insurance of the inability to pay for life‐saving medical treatment. Interview and photo opportunities by request. For a PDF of this press release, click here. © 2019 Hope For Hearts Foundation.